Mumbai-based Public Concern for Governance Trust (PCGT) is among the handful of non-profits listed with us promoting good governance. PCGT is over a decade old and has the ability to mobilize public opinion and increase their participation and activism towards creating more transparent and efficient governance! PCGT takes up socio-political causes, which affect large segments of society, particularly the poor in Mumbai and Pune. Numerous workshops on Right to Information (RTI), Right to Education and Right to Service are conducted annually in schools, colleges and other public places. Volunteers of PCGT visit other NGOs, particularly child-centric organisations to inculcate values of honesty, accountability and integrity in children for a corruption-free India. They have produced a movie ‘Be The Change’, to convey its messages to the community. It also promotes the need for good governance among government bodies at the state and national level. PCGT has assisted individuals and institutions in filing several hundreds of RTI appeals on various matters. In an attempt to inculcate good values in children, PCGT visited 28 government and private schools in FY13 to conduct workshops. PCGT’s motto is to fight against corruption and the team has been adhering to their motto since inception. However, considering the nature of activities, PCGT finds difficult to quantify its impact. PCGT’s total income in FY13 declined substantially by 55% YoY, which was an outcome of significant 72% YoY drop in contributions received from institutional donors. This resulted in PCGT reporting a deficit for the first time in past four years i.e. FY10-FY13. Although interest income was the second largest source of income for PCGT in FY13; in absolute terms, it fetched only Rs0.4mn. 59% of total expenses in FY13 were incurred towards various advocacy projects. Some of these include running the RTI clinics, Kuchh Aur and Bapu Ne Kaha Tha, Vigilance Awareness Week, Autonomy of CBI and Corruption Hatayenge. 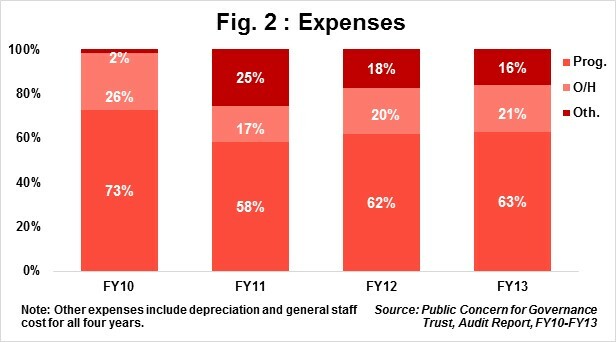 Overheads accounted for 21% of total expenses in FY13. This was above the sector average range of 7% to 16% in FY13. PCGT operates from one of Glenmark’s offices in Mumbai and pays minimal rent annually. Fixed Asset includes only 5-6 computers and some stationery. Besides this, the movie ‘Be The Change’ is valued at Rs1mn in FY13. PCGT’s negative growth in FY13 dragged its 4-year income CAGR to -21% for the period FY10-FY13. 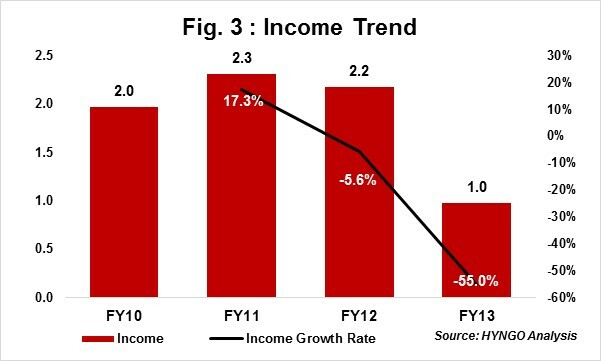 Even after excluding FY13 income, 3-year income CAGR was only 4% for FY10-FY12. The low performance is an outcome of excessive dependence on a handful of committed donors and relative reluctance to fund governance-related NGOs. 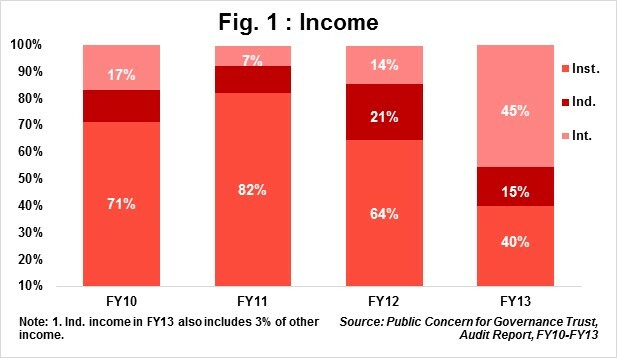 Self Sufficiency Ratio (SSR) which measures an organization’s ability to meet operating expenses from its own income sources like donations from individuals, service charges and interest income has remained on relatively low at 27% for PCGT since FY13. This is primarily because of its inability to broaden their donor base. Lack of human resources. PCGT has struggled to retain its qualified employees as it cannot afford to pay compensations in line with that offered by for profits. To address this, they should consider roping in a financial partner whose mandate could be to support PCGT by paying employee salaries. PCGT received donations from HDFC in the past to pay employee salaries only. Develop alternate source of funding. This could be possible by charging fees for conducting workshops in corporates and business schools as this may serve a dual-purpose of promoting good governance and generating own income. PCGT was founded by three eminent citizens, Senior IAS Officer Late Mr. B. G. Deshmukh, former Commissioner of Police (Mumbai) Mr. Julio Ribeiro and internationally recognized pediatrician Dr. R. K. Anand. PCGT’s Board comprises of nine influential personalities (incl. co-founders) in diverse fields like finance, media, sociology, government administration and manufacturing. None of the trustees are related to each other and meet once every quarter. However, the founders meet once every week.